A semi-prototype of the blanket first wall panel, one-sixth of the size of the actual component, has been successfully manufactured in Europe. In the ITER machine, 440 such panels and their corresponding shield blocks will make up the ITER blanket. The first of a series of steps to qualify the fabrication of the ITER blanket's first wall panels has been achieved in Europe, with the successful manufacturing of a semi-prototype. The completion of the 1:6-scale model moves the European Domestic Agency a step closer to obtaining qualification for series production. The panels are 1 x 1.5 metre detachable elements which, together with the shield block, form the ITER blanket modules. 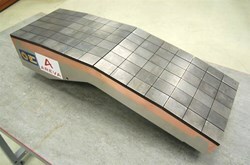 Designed to withstand the heat flux from the plasma, the first wall panels are high-tech components made of beryllium tiles that are bonded with a copper alloy and 316L (N) stainless steel. Europe is responsible for procuring the normal heat flux first wall panels (about half of the 440 panels required for the blanket); China and Russia are sharing the procurement of enhanced heat flux panels that make up the other half. The semi-prototype will now be subjected to an electron beam capable of applying the same heat flux the panels will experience in the ITER machine, bringing the surface temperature of the beryllium to approximately 400°C. The European Domestic Agency has awarded the grant for high heat flux testing to the German research centre Forschungszentrum Jülich, which expects to complete the campaign this summer. A Procurement Arrangement is scheduled to be signed with the ITER Organization in early 2015 for the procurement of Europe's portion of the first wall panels. Read the full article on the European Domestic Agency's website.